DECEMBER 2, 2010 – There is a growing chorus of voices in the media and the academy singling out the actions of the Chinese state as central to the dilemmas of the world economy. This focus finds its most articulate presentations, not in the xenophobia of the right, but in the polite analysis of many left-liberals. Paul Krugman, for instance, writing in the run-up to November’s G20 summit in South Korea, praised the United States’ approach of creating money out of nothing (“Quantitative Easing”) as being helpful to the world economy, and criticized the Chinese state’s attempts to keep its currency weak as being harmful. “The policies of these two nations are not at all equivalent,” he argues, adding his influential voice to the chorus which is increasingly targeting China for the world’s woes. Krugman’s, however, is a simplistic analysis which overlooks the role of the U.S. over decades in creating huge imbalances in the world economy, and has the dangerous effect of scapegoating one of the poorest nations of the world (China) for the problems created by the world’s richest. Krugman’s argument proceeds through a sleight of hand. He objects to the attempts by the Chinese state to keep down the value of its currency – the yuan – as a series of policies whose “overall effect … on foreign economies is clearly negative.” This is a common theme – China’s “weak-yuan” currency being good for China (making its exports cheaper in world markets) and bad for the rest of the world. Let’s begin with some of the key facts. At the peak of the economic crisis, the United States, Canada, and the European Union had to borrow hundreds of billions of dollars from the rest of the world to finance stimulus programs to stabilize their economies. China also engaged in serious fiscal stimulus (relative to GDP virtually on the same scale as the United States), but unlike the North American and European powers, it was able to do so without borrowing a penny from the rest of the world. One of the reasons the U.S. had to resort to large-scale foreign borrowing, was because of years of high levels of central government deficit spending. Charts accompanying this analysis can be found at the end of the article. The first one shows the last twenty years of central government spending, a story of only momentary surpluses and a “norm” of deficits in the hundreds of billions of dollars – in 2009 and 2010 in the wake of the financial crisis, passing the one trillion dollar mark. Because the United States central government had been running very large deficits for years, borrowing on a large scale was inevitable to do the very necessary work of trying to “stimulate” the economy at the peak of the crisis in 2009. But with these deficits pushing debt levels very high very quickly, there has been increasing nervousness about both deficits and debts getting out of hand. Enter, “Quantiative Easing.” As an alternative to creating more government debt, the world’s most powerful economy can, for the moment, simply “create more money,” push it into the economy, and hope that this has the desired stimulus effect. Krugman assesses the merits of these actions solely on their effect on world demand. But is this a sufficient criteria? There are all sorts of policies pursued by the U.S. over generations which have increased overall world demand. One in particular comes to mind. The U.S. central government has for a long time been the centre of military expenditure in the world, and its role as such is accelerating. In 1990 its military expenditures represented 36.19% of the military expenditures in the entire world. By 2009, its military expenditures had grown to fully 44.13% of world military expenditures. In other words, almost half of the money spent on war in the world is spent by the U.S. state. This huge infrastructure of planes, missiles, bases, tanks, guns, ammunition and personnel has a powerful effect on demand in the world economy. For instance, “the U.S. military is the single largest consumer of energy in the world.” This might be bad in terms of global warming. Nonetheless gobbling up millions of barrels of oil certainly helps stimulate world demand for petroleum. The trillions spent on war and militarism do meet Krugman’s criterion in that they “stimulate world demand.” But they do so in perverse ways. In particular, they are the principal reason for the desperate fiscal weakness of the U.S. central government, documented above, fiscal weakness which is driving the move to Quantitative Easing. 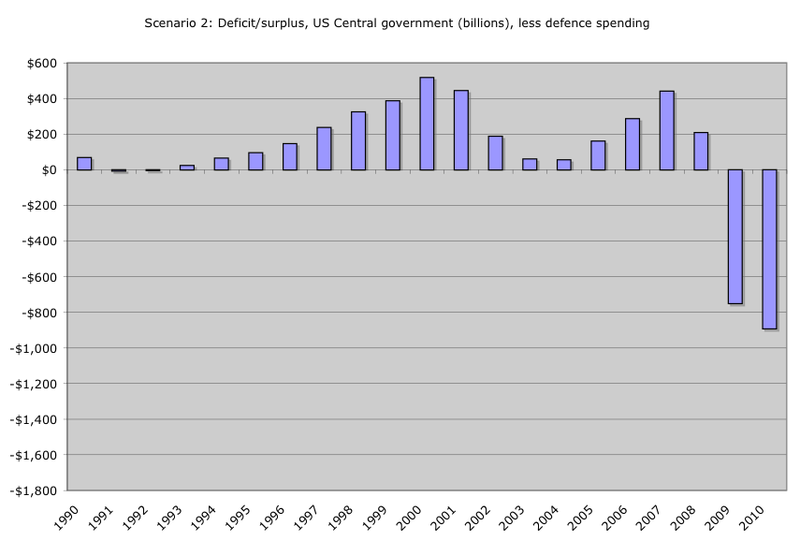 Let’s try on three different scenarios to examine the relationship between military expenditures and U.S. deficits. Begin with one aspect of arms spending, the “War on Terror.” Launched in 2001 it has had three components – Operation Enduring Freedom (the war in Afghanistan), Operation Iraqi Freedom (the war in Iraq) and Operation Noble Eagle (beefing up U.S. military bases and homeland security). The official bill to-date for this “War on Terror” is almost identical to the amount of money created in the first round of Quantitative Easing – $1.1 trillion dollars. This is probably an understatement, perhaps a gross understatement. Joseph Stiglitz and Linda Bilmes estimate that the true cost of the war in Iraq alone will be in excess of $3 trillion. However, for arguments sake we will take the official figures. If those official figures are removed from the books (scenario 1) – that is, if we see what the picture would be like had the War on Terror not been launched – then a change begins to take place in the picture of U.S. deficit spending. It doesn’t eliminate the deficit problem. But it does lessen it, to the extent that as late as 2007 – the year the financial crisis first revealed itself – the U.S. central government would have actually have run a modest surplus. But the War on Terror is just the tip of the iceberg. The United States, as documented above, spends money on the military at a rate far greater than any country in the world. In 2010 for instance, the War on Terror costs of $130 billion were dwarfed by the $534 billion spent on other aspects of the military. Since 2006, the total “defence” budget of the U.S. has been over half a trillion dollars. By 2011 it is projected to be closing in on three quarters of a trillion dollars. Now imagine a pacific instead of a militaristic United States. In other words, see what the picture would be like without sustaining this massive war machine. When this military spending is removed (scenario 2), the picture of the U.S. central government budget is completely different. 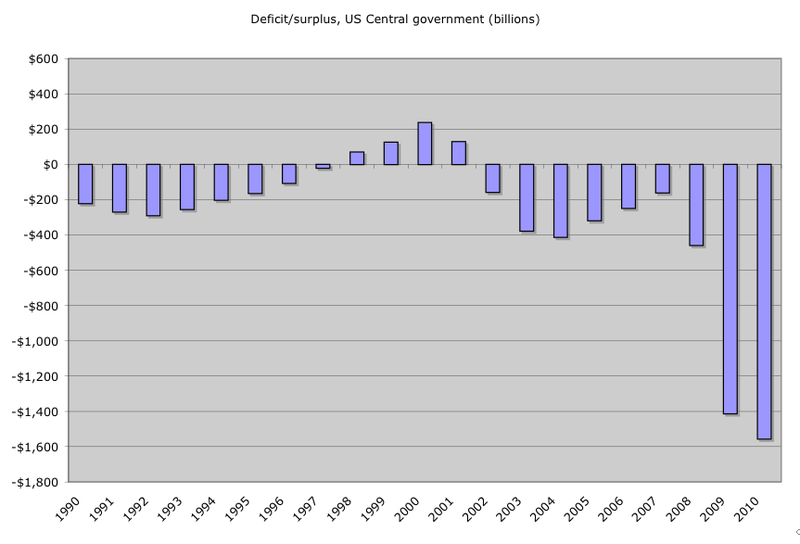 In 2009 and 2010 there are of course quite large deficits. This is the normal “Keynesian” turn to deficit spending that occurs in any economic downturn. What is remarkable however, is the fact that in terms of non-military spending, before 2009 and 2010, there would have been no deficit whatsoever. 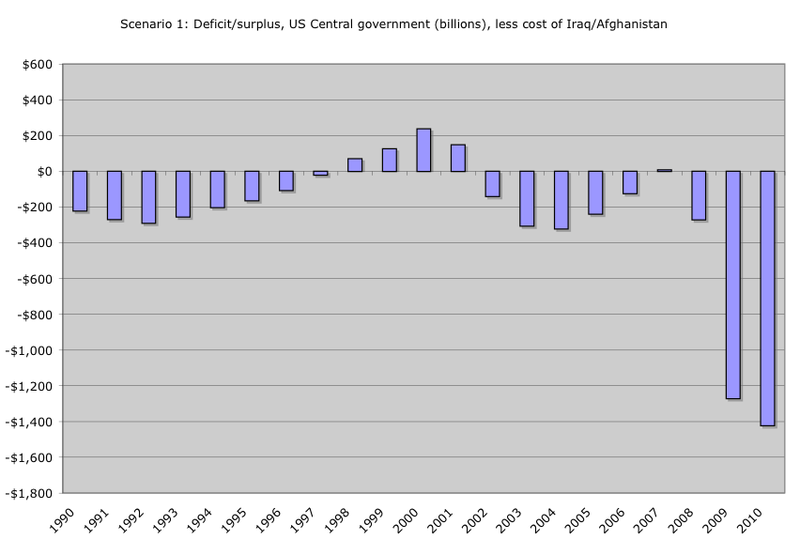 In fact in many years there would have been surpluses, twice (in 2000 and 2007) touching half a trillion dollars. With a budget history for the last 20 years resembling this graph, a pacific U.S. government could have spent billions on its stimulus package, without borrowing a dime. Stimulus could have been completely financed out of accumulated surpluses from the last 20 years. And in fact, this understates the situation. Many of the costs of the U.S. bloated war budget are hidden. It would take a team of forensic accountants with unlimited time and unlimited funds to sort through government finances and corporate balance sheets to tease out the actual costs of sustaining the world’s biggest military, and the world’s only truly global empire. But there are two “non-defence” line items that we can say with certainty are directly related to the U.S. military. Veterans Affairs spending is extremely high in the U.S. precisely because so many young people have come back maimed and broken through U.S. military adventures abroad. And the space program is a barely disguised excuse to develop and test the rocket technology that is the backbone of the U.S. nuclear arsenal. When these two are factored in (scenario three), the picture is breathtakingly clear. 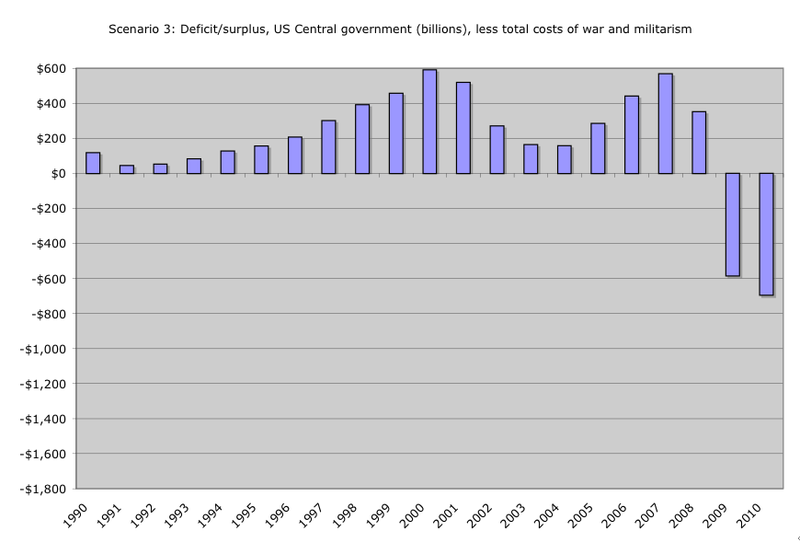 The U.S. central government deficit problem has one source – addiction to war and empire. That addiction has led to borrowing on an unprecedented scale, making it impossible for the U.S. to stimulate its economy through accumulated savings and making it increasingly nervous about the accelerating practice of borrowing on a mass scale. The Quantitative Easing approach – creating money out of nothing – has been made inevitable by the massive deficits used to sustain empire abroad. Return, then, to Krugman’s argument. If we only have one criterion by which to assess this – the creation of demand in the world economy – then there is no problem here. Massive levels of arms spending create demand. Years and years of arms-related U.S. budget deficits do “stimulate” the world economy. But downing two or three pots of coffee in one setting will similarly “stimulate” a person’s metabolism. That doesn’t mean it is a recommended method by which to obtain our nutrition. Obviously “the creation of demand” is not the only criteria we should use. When trillions are spent, it is useful to us ordinary folk when these trillions are spent in productive ways – on homes for the homeless, on childcare, on healthcare, on education, on infrastructure, on subways, on clean energy, on water purification in the Global South – the list is endless. But when the trillions are wasted on grenades, nuclear weapons, M-16 rifles, nuclear submarines, aircraft carriers and all the other paraphernalia of the U.S. killing machine – this is ultimately the equivalent of taking those trillions and flushing them down the toilet. It is “investment” which leaves nothing behind – except nuclear waste that future generations will have to dispose of, deadly munitions that will exist for generations to maim and kill peasants in the field, and broken bodies and minds chewed up in endless wars. The creation of “demand” is not the only criteria. It matters – and it matters desperately – exactly what kind of “demand” we are feeding. And think this through. This creation of money from nothing will systematically drive the U.S. dollar lower relative to other currencies. For those holding billions (and in some cases trillions) of U.S. dollar denominated debt, the devaluation of the U.S. dollar means a devaluation of the worth of their holdings. In effect, the United States through Quantitative Easing is forcing the rest of the world to pay for its empire, to pay for the costs it has incurred through sustaining a bloated Permanent Arms Economy. It is irresponsible to assess the value of the policies of the U.S. and Chinese governments by narrowly focussing in on momentary decisions related to their currencies, and by pretending that these policies happen in a vacuum. There is a history to the current predicament of the United States, a predicament of its own making. When put in this bigger context, the message that must be sent to Krugman and others making similar arguments is quite clear: blame the wars, not China. This article has been published as “War and the Global Economic Crisis: Blame America’s War Economy rather than China,” Global Research, 23 December 2010. Also published as “War and the Global Economic Crisis,” Нова српска политичка мисао, 25 December 2010; “Message to the US – Blame the wars, not China,” Links, 2 December; “Message to the U.S. – Blame the Wars, not China,” The Bullet No. 444, 23 December. Paul Krugman, “When China Exports, Everyone Pays,” Truthout, 4 November, 2010. Eswar Prasad, “Assessing the G-20 Stimulus Plans: A Deeper Look,” Brookings, 2 December, 2010. Joseph Trevisani, “While Many Countries Must Borrow, China and Japan Can Fund Their Own Stimulus,” Seeking Alpha, 28 January, 2009. Sohbet Karbuz, “US Military Energy Consumption – Facts and Figures,” Sohbet Karbuz, 20 May 2007. Amy Belasco, “The Cost of Iraq, Afghanistan, and Other Global War on Terror Operations Since 9/11,” Congressional Research Service, 2 September 2010: 1 and 3. Joseph E. Stiglitz & Linda J. Bilmes, “The true cost of the Iraq war: $3 trillion and beyond,” The Washington Post, 5 September 2010. Isn't the Fed creating money OUT OF DEBT rather than OUT OF NOTHING? I thought the Fed created money by purchasing US Bonds, which bear compound interest. The american taxpayers then have to pay back both capital AND interest to eventually reimburse the Fed. The Fed would be creating money 'out of thin air' if it credited the US government bank account with billions of dollars, but without demanding an equivalent amount of US bonds bearing interest in return, which bonds must be reimbursed over time. Quantitative Easing is not free, it is the US government borrowing money from the private central bank (the Fed) at interest. Can you elaborate and correct me on this specific issue? PS. I was unable to find your email, so I posted this comment.